(Bloomberg) -- The U.S. has some "some hard work" to do with North Korea before President Donald Trump meets Kim Jong Un in Vietnam later this month, according to its special envoy Stephen Biegun. Trump is "very much looking forward to taking the next steps," according to a pool transcript of Biegun's remarks on Saturday. 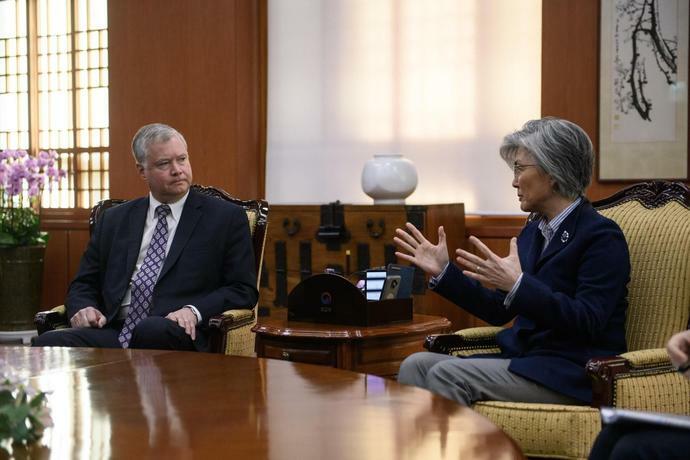 The envoy on North Korea spent three days negotiating with officials in Pyongyang before meeting with South Korean Foreign Minister Kang Kyung-wha in Seoul. "I'm confident that if both sides stay committed we can make real progress here," Biegun said. "We don't know where it's going to go but we are in the midst of a conversation with the North and our discussions were productive." Biegun didn't say exactly what steps were left to take with North Korea. The State Department earlier said Biegun and his North Korean counterpart agreed to meet again in advance of the Trump-Kim summit. Trump tweeted shortly before Biegun met with Kang that he would hold his second summit with the North Korean leader in the Vietnamese capital of Hanoi on Feb. 27 and 28. In a second tweet, Trump praised Kim as a leader who would turn North Korea into a "great Economic Powerhouse." North Korea's official Korean Central News Agency separately said earlier Saturday that Kim visited the defense ministry on Friday to commemorate the founding of the Korean People's Army and called on the military to play a substantial role in developing the economy. Although the North Korean economy is believed to have improved in recent years, it has been hurt by sanctions imposed over its nuclear weapons program and the country remains one of the poorest. The nation of 25 million people offers a labor force that remains largely untapped and holds minerals and rare earths that China has had a near monopoly on. WASHINGTON (AP) - Democrats are trying to make President Donald Trump's conduct part of their 2020 election push, but they're struggling over whether to actually try and impeach him. WASHINGTON (AP) - President Donald Trump and his business organization sued the Democratic chairman of the House oversight committee on Monday to block a subpoena that seeks years of the president's financial records. WASHINGTON (AP) - The Trump administration is poised to tell five nations, including allies Japan, South Korea and Turkey, that they will no longer be exempt from U.S. sanctions if they continue to import oil from Iran, officials said Sunday. Bernie Sanders is Bernie Sanders at Fox News town hall and survives. Who&apos;s next? Anyone? Bernie's Fox News Town Hall Was a Ratings Smash. More Dems May Follow Him There. Bloodthirsty Democrats lose after Mueller report findings. Trump and the US win. Boeing 737 Max: How will airlines convince skittish passengers it&apos;s safe to fly again?